ADA Compliance: Is Your Campsite Fully Inclusive? Many agencies may feel a little overwhelmed when they first look at their aging campgrounds and are told to bring them up to current ADA regulations. You want to maintain the natural character of the campground without turning it into a concrete jungle. After all, the natural environment is why the public has been coming there for years. So, where do you start? There are many site amenities and programmatic relationships that need to be evaluated and it’s important to take into account how park visitors will interact with each space. The simplest way is to start by making your ADA Checklist, which will help you provide a consistent approach when evaluating your facilities. Below, I’d like to review some of the most crucial things to consider including in your checklist when evaluating your campground facility. You will need to identify how many of your camp spaces need to be ADA compliant. For example, if you are adding or altering a campground of 51-75 campsites, at least four of those must have mobility features. The other question that often comes up is how to demark these campsites so that those who have need of an ADA friendly site can access them more readily. While spaces are not required to be identified by signage, we would recommend this practice. Methods for reservation and access to the sites should also be provided on websites, brochures, and bulletin boards. Agencies should develop policies to ensure that these campsites are available for individuals with disabilities until all other campsites are filled. Dispersing the ADA campsites so that you offer a variety of experiences will also make your campground more inclusive. Your users may want to tent camp or have recreation vehicles. 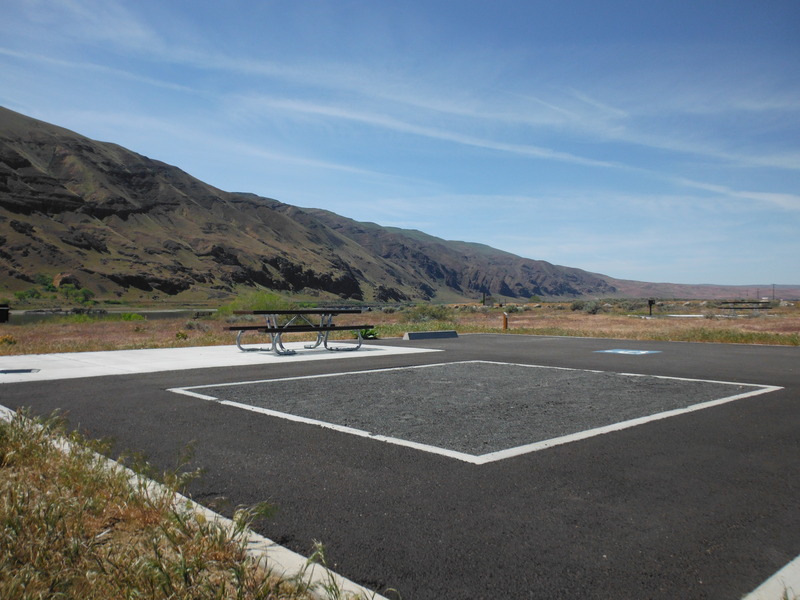 Providing a variety of campsites such as pull-through, back-in, and wheelchair accessible walk-in sites is a great way to provide more inclusive options for the user. Many tent and recreational vehicle campsites we visit are not paved and, therefore, will not meet the ADA surface stability requirements. Asphalt pavement is the most cost effective way to meet the stability requirements and feels more natural in this environment than concrete. When it comes to tent camping sites, you may question whether to supply a pad or a platform? From an inclusivity standpoint, we feel that providing both options allows for broader use for camp users. It’s also important to make sure you provide a stable surface for the required clear ground space around the tent area and that the slope does not exceed 2% in any direction. The tent pad itself can be made of a variety of materials including grass, gravel, bark mulch, or sand and the size may vary depending on the space available. As you may have experienced, recreational vehicle spaces are normally tight as they are fit amongst the trees and natural vegetation. To preserve this experience we recommend not exceeding the 20 feet minimum width for recreational vehicles and 16 feet for other vehicles. The depth of the stall will depend on user base and environmental conditions, but the typical depth of a recreational vehicle these days is around 50 feet. Remember, ADA parking stall slopes should not exceed 2% in any direction. Not all campsite may require all of these amenities, but you should evaluate them as options for both convenience and inclusivity. When selecting ADA compliant amenities, it’s important to consider the required specifics for clear ground space and stable surfaces for access. Maintaining a balance between the amenities provided and preservation of the natural environment is key to using the space effectively. Hopefully this information provides the groundwork to help you evaluate your compliance requirements. Providing an inclusive camping experience that allows everyone to experience nature will increase stewardship and provide a lasting experience for the user.